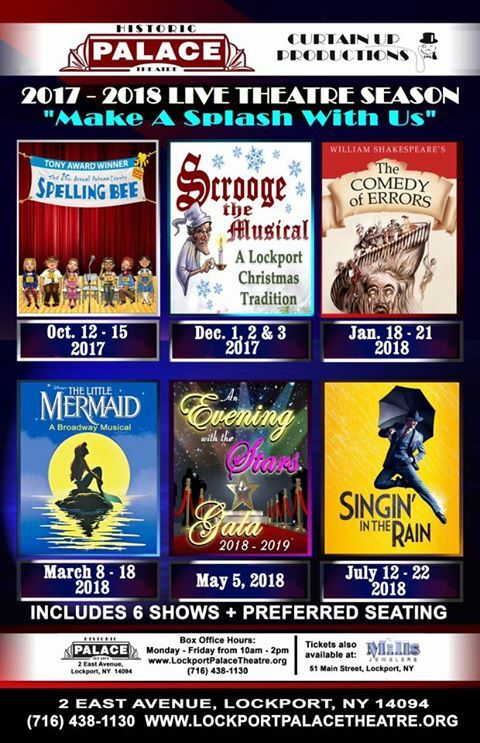 It’s that time of year again when Lockport’s historic Palace Theater unveils their shows for another new season. As season ticket holders, Wendy and I, along with several hundred of our closest friends, are among the first to learn what masterpieces will be displayed across our local stage. There’s always something for everyone. They opened the show with the actors and actresses singing Journey’s “Don’t Stop Believing.” It was an interesting start to the evening. It was something I was not expecting. I guess you could say that the message was don’t stop believing in yourself. Even in a small town like Lockport, you can make a big difference. David Wohleben, treasurer of the board of directors, announced the first show of the season, “The 25th Annual Putnam County Spelling Bee.” The show will run October 12-15, 2017. This show is a one act, musical comedy starring six adolescent contestants and three adults who run the spelling bee. The show is based upon a book by Rachel Sheinkin which was made into a Broadway musical by William Finn in 2005. For the Lockport Christmas tradition, Ellen Roth introduced “Scrooge: The Musical.” The show will be onstage December 1-3, 2017. First appearing as part of the Palace season in 2003, the show has delighted audiences and countless community members over those fourteen years. This year’s production will mark fifteen years as part of Lockport’s holiday season. A plus for me was seeing my kids in the commercial that promoted the show. I’m sure at least three of the Bacon Bits will audition for the show again this year. Geoff Koplas, fresh off singing “How Can a Woman Like Her” for the “Scrooge” promo, announced the January play. This season will see William Shakespeare’s “The Comedy of Errors.” This is one of the Bard’s early plays, a farce that combines slapstick and mistaken identity to take the audience on a wild ride of laughter and mayhem. As this is one of my favorite works by Shakespeare, I eagerly look forward to January 18-21, 2018. It should be a great time. The Spring show was announced by Scott DeLuca and his daughter, Ainslee. Disney’s “The Little Mermaid will be gracing the Palace stage March 8-18, 2018. Emily Prucha sang “Part of Your World” from the musical. Taylor Carlson then joined her on stage to perform “Poor Unfortunate Souls.” That is one of my favorite songs from the musical and Taylor sang in wonderfully. She had all the mannerisms of Ursula down, which made the song that much better. 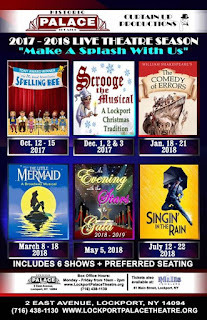 The final show of the season was unveiled by Ellen Schratz as “Singin’ in the Rain.” This musical is based upon the 1952 film, starring Gene Kelly and Debbie Reynolds. Don Lockwood is a silent film star who is forced into a “talkie” after the success of “The Jazz Singer.” They encounter a stream of difficulties that changes the focus of the film yet again. Robbie Syruws, Katie Merrill, and Sean Murphy took on the roles of Don Lockwood, Kathy Selden, and Cosmo Brown and sang/performed “Good Morning,” complete with the tipping of the bench. Joshua Ranallo then sang the title song, “Singin’ in the Rain.” I can’t wait to see how they make it rain on the Palace stage. There is still one show left on the 2016-2017 Palace season, with “Billy Elliot,” which will be performed July 13-23, 2017. The musical takes place in northern England during the miner’s strike of 1984-1985. Set against this backdrop is the story of Billy Elliot, a young boy who would rather dance than box, and all the struggles he has to overcome to achieve his dreams. Craig Bacon is excited for another year of theater at the Palace. If you stop in for a show, be sure to visit him and say hello.